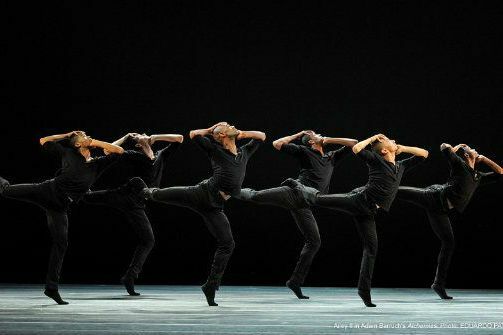 Alvin Ailey II in Adam Barruch's Alchemies. Photo by Eduardo Patino. BOTTOM LINE: These three young choreographers and the Ailey II dancers have lots of drive, verve and everything to prove, and the combination makes for a vibrant and energetic evening. The first piece on the program, Alchemies by Adam Barruch, is a slice of modern, edgy and high tech aesthetics. The dancers are all suited up in sleek black and move with Barruch’s signature voluptuous arms that almost seem like another entity. The entire company dances this conveyor belt-like first section and it felt like the dark sci fi planet of Camazotz from Madeleine L’Engle’s “Wrinkle in Time,” the people seeming almost like robots but in a very human shell. There were innovative duets and a striking scene burned in my memory of a gloriously lit panel by Aaron Coup across the back where the dancer’s steps served as a metronome to the repetitive pulsing music of Raime against a raging duet. Cuore Sott’olio is Kate Scarpetowska’s contribution to the evening with a dance about a woman's journey through relationships. It starts with electronic music as if rewinding into a part of her feminine self. An innocent and playful couple, a lustful, and almost masochistic pair, and a more independent and forward moving duet are the meat of this sandwich and they stand very well showcasing some of her Lubovitch and Parsons dance vocabulary in which she is well versed and then adding an element of storyteller. The final piece of the evening is sweeping, decadent and daring. Jennifer Archibald’s Wings showcases the individuals in the company and makes them look like birds flying across the space, their wingspans becoming more infinite by the moment. The men looked especially stunning as they executed duets and their masculine and fluid strength. Archibald’s poetic musicality and the score by Michael Wall is breathtaking and the dancers punctuated the steps with jerks and gestures of pressing the hands down to their hearts. These dancers have the youthful competitiveness of an eager company. They gave their hearts and it was clear that they were each trying to make their mark on the audience with self assured confidence. It felt as if they were all morning glories and the stage was their sun. It is a beautiful thing indeed, but at points takes you away from the choreography. It is an energizing show and it was amazing to see the young dancers' interpretation of a youthful vision.